Southern Illinois University Edwardsville professors Mike Shaw and Brad Noble have received the Graduate School’s Concept Commercialization Award for 2017. The award provides $15,000 through April 9, 2018 to assist in the marketing of their Digital Potentiostat Circuit and System. The duo received a patent (U.S. Patent Serial No. 13/371,230 issued as patent no. 8845870) in 2014 for the digital potentiostat. Shaw is a distinguished research professor in the Department of Chemistry in the College of Arts and Sciences. Noble is an associate professor of electrical and computer engineering in the School of Engineering. They designed a ‘no frills’ electrochemical and spectroelectrochemical methodology for teaching environments. The circuit was designed to minimize cost, yet still deliver high quality data for a limited range of functions suitable for the teaching lab. The basic concepts that can be demonstrated with this device are relevant to studying batteries, fuel cells and solar cells. Shaw and Noble believed that the scarcity of actual electrochemical practice at the freshman and sophomore undergraduate level was likely due to the expense to acquire reliable instrumentation. Potentiostats can range in cost from $6,000-$20,000 and more than 20 would be needed to run undergraduate laboratories. Their goal is to achieve broad dissemination of units through a commercial partner to reach more undergraduates, high school students and, perhaps, home-schooled students. Shaw and Noble began designing the potentiostat in 2009. The Concept Commercialization Award (CCA) is designed to stimulate interest in and involvement with intellectual property development and commercialization to promote public health, safety, welfare of the community and the economic welfare of the University. It supports the work of SIUE discoverers and inventors, and supports the surrounding community by encouraging industry investment. 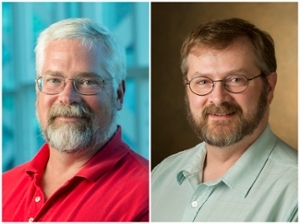 Photo: Brad Noble (left), associate professor of electrical and computer engineering in SIUE’s School of Engineering.Mike Shaw (right), distinguished research professor in the Department of Chemistry in SIUE’s College of Arts and Sciences.